I’m going to make this short and sweet. Ware is a must play in cash games. He’s going to be massively owned, in a great spot, on a great team, with a massive implied total, as massive favorites, that can catch passes, and is super cheap. A tournament fade is viable I guess…but you are better off differentiating elsewhere. I still doubt he gets above 50% in tournaments…so just take the edge over the fish that fade him. We for sure have the salary to get up to Gurley this week, and…aside from last week where he wasn’t on the main slate…he’s cheaper than he’s been since week 4. The Rams are 10 point favorites, implied to score 32.5 points. The Lions have been much better at stopping the run since they traded for Snacks Harrison…not that matchup means anything for Gurley. He seems to be 100% from his ankle injury, and we know that he’s even more involved in the red zone when Kupp is out. The only case to not playing Gurley is if you want to play McCaffrey instead. But there is also the case for playing both. McCaffrey is your other expensive option at RB (and we always pay up at RB). Fresh off his 50 point explosion CMC gets the dream matchup with the pathetic Bucs defense. CMC has been playing 99%-100% of snaps that Newton is on the field, only leaving when they were getting stomped by the Steelers. He’s involved all throughout the field and has more recently been featured near the goal line. The last time these two teams met just a few weeks ago CMC posted 17/79/2 on the ground and 5/78/0 through the air. That’s essentially what we can expect from him in this game…with TD’s being the part that varries. 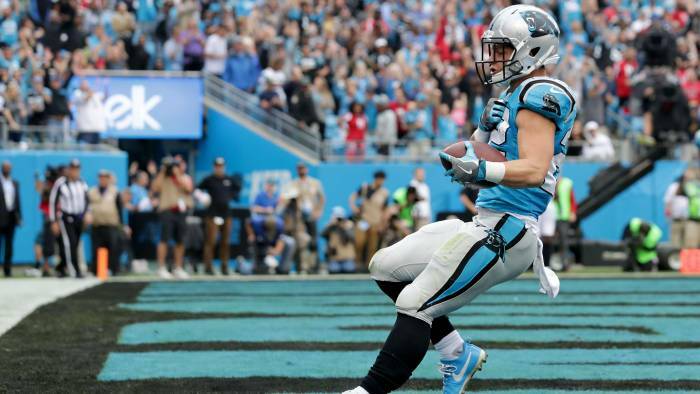 The worst case for McCaffrey is 13-14 points…and he clearly comes with another 50 point ceiling (although I’d say his range of outcomes this week is between 20-30 points). You can play both CMC and Gurley, but I like builds a little better if you pick one of them. This is the cheapest price point for Barkley since week 6 against the Eagles…where he posted 41 DK points. Barkley is both matchup and game script proof thanks to his involvement in the passing game. The Bears are a great defense, and the Giants are not a good offense. Because of this I’d expect Barkley to be around 11-14 carries, with something around 4-7 targets in the passing game…plus his red zone work. The Bears have the #1 ranked rush DVOA, and the Giants o-line holds the leagues 7th highest adjusted sack rate. This is a terrible spot…but that’s reflected in the discount. Jones is the last of the RB’s I’d consider. You should always be playing a RB in the FLEX, and I’d be shocked if you liked a roster construction that didn’t have Ware in it. That leaves you with 2 RB spots…and those two should come from this list of guys. If you are playing multiple lineups, then rotate through different combinations of these 5. There isn’t much not to like about Jones. He’s a 14 point home favorite, implied to score just under 29 points, and has finally been unleashed as the lead back. Jones has double digit targets in 5 straight games, and 20 targets over the last 4 weeks. He’s a very strong bet for at least one TD in this spot, with a good chance to go over 100 total yards. He does have a lower floor than all of the other stud RB’s, but he comes at a much cheaper price as well. Hill’s price is absolutely insane. You are legitimately paying over 9K for somewhere in the range of 8-10 targets. Even with that though, Hill might be the best WR play of the week (behind Godwin of course). The Raiders get absolutely crushed by deep passing, allowing the highest yards per attempt in the NFL…and an absolutely staggering 27.6% increase in YAC/R…by far the most of any team, and more than double the third worst team. The Raiders have given up on defense, so with Hunt cut and Watkins injured, Hill is set up for an absolutely monster game. The ONLY way that he fails is if they score 4 quick TD’s and he doesn’t have any of them. You can’t make a team that doesn’t have any Chiefs players on it, and I’d have a very tough time fading Hill, even at his price. His current projected ownership is 23%. There is a very real possibility that he posts a score that sinks the 77% that fade him (like he’s already done 4 times this year). There isn’t a single game in there that you would be upset about at $3,900. Add to it a 25.5 point implied total, against the 27th ranked pass defense, and you get an absolute smash spot. PFF currently has Godwin at 5% projected ownership. That’s not going to happen. But if he stays under 20% then just thank the other 80% for their money. Cooks and Woods are both too cheap. The Rams are going to score over 32 points, and the Lions defense isn’t one to fear. Cooks has target counts of 8/8/12/12 over the past month…with Woods seeing 7/9/5/11 over that same stretch. We all know that Cooks has the higher ceiling, but Woods has been incredible consistent this season. He hasn’t been under 12 DK points since week 1, with 70 or more yards in every game since week 1. That’s extreme safety against Detroit’s 31st ranked pass defense. I’m cool if you play either of these guys since both should post decent scores. My lean is with the safety of Woods, but you can’t really go wrong with either. Just make sure you don’t play both unless you have Goff at QB. Sanders is coming up a lot in optimal builds. I’m not in live with the play since I’d prefer getting up to the elite RB’s and Ebron, but I can see why he’s popping. Sanders gets to face the Bengals pathetic defense in a game that should stay relatively close. Sanders has 29% of the teams air yards over the season, but over the last three weeks that number has been 36%, 25% and 59%. The departure of DT has shifted this passing game to resemble that of the Vikings. If Sanders is going to have 40% of the teams air yards against this Bengals defense, then $6,300 is about 1K too cheap. I’m not prioritizing him, but if that’s how much salary you have left for your last WR spot, then I’m more than OK clicking his name. I was on Humphries last week, and I’ll be going right back to the well again this week. Hump has actually been really solid over the last two months, and that’s with Jackson playing. I expect Winston to throw for around 310-350 yards in this game, so with Jackson and Howard out, those yards have to go somewhere. Adam is not going to get you 100 yards…but he does have double digit DK points in 5 of his last 7, and he’s a safe bet for 5-8 targets. Combining the prices of Godwin and Humphries costs you $8,100…and we can expect around 15 targets with almost certainly at least one TD. You can play both of them at WR, then pay up for the rest of your roster. I really can’t imagine a world where the both of them fail. This is a lot of salary to use towards QB…especially in a game that we don’t expect to be overly competitive. 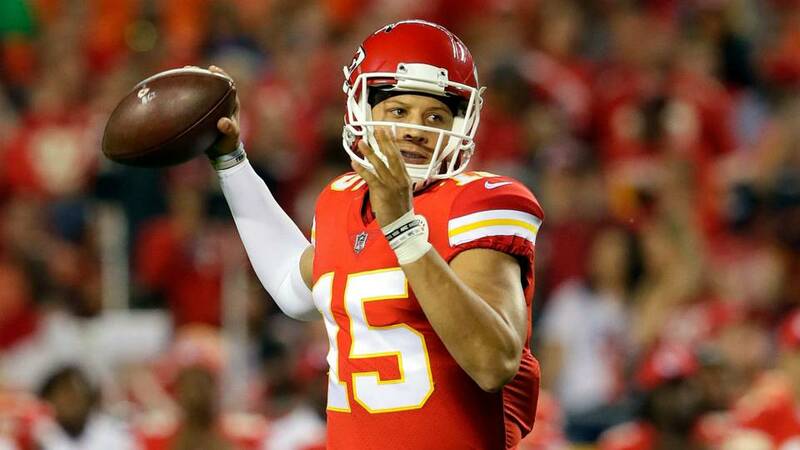 The appeal with Mahomes this week however is that we have a bunch of pay down options at other positions. Ware and Godwin are essentially free squares, you can always find a cheap D/ST, Ebron and LaCosse are under priced, and you can make the case for a few others as well. We have to spend our salary somewhere! Mahomes gets to play a Raiders defense that has been an utter embarrassment, ranking second to last in adjusted sack rate and third to last in both rush and pass DVOA. Matching up Mahomes and Hill is almost to easy this week. The Mahomes/Hill/Ware stack is going to be the chalkiest stack we have seen this season…and yet it’s still going to be owned less than it should be. I’ve yet to decide if he’s the best cash game QB. Even if he posts a great game, he’s unlikely to go over 30 points this week. If we can find 25 points for over 1K savings then it might be worth dropping down. Winston is always a scary play, given that they could pull him at any moment. This doesn’t seem like the spot where that will happen though. Jackson is hurt so they Bucs will finally be freeing Chris Godwin…and the Panthers have been really bad in red zone defense. We loved this spot to shoot out in their last meeting, and there is no reason it can’t happen again. It’s going to be tough to determine where the TD’s will come from, but there will be TD’s, and my guess is that they come through the air (CAR is 7th in rush DVOA and 27th in pass DVOA. They are also one of the worst teams at defending TE’s and give up a deeper ADOT than most teams). You can fit some crazy stuff with Driskel at QB this week. I’m unlikely to go here myself with the value at all the other positions, but if you don’t want to pay for Mahomes, and you don’t love the other QB options, then Driskel is your guy! He’s a solid athlete (not Lamar Jackson…but he’s no scrub) so he’ll be able to pick up yards on the ground, plus the Broncos defense hasn’t been all that great this season. Chris Harris has been great, but their outside CB’s have been mediocre. I’d expect something like 200 passing yards and 1 TD from Jeff…with a chance to add another 30-40 and a TD with his legs. If he can get to 18 then you are fine…it’s all if you think he can get there. Ebron is likely going to be the second highest owned player this week behind Spencer Ware. He does get a brutal matchup against the Jags defense, but he’s the only healthy TE on the Colts at the moment, and Luck loved looking his way, even when Doyle was healthy. The pricing came out before the Doyle injury news so this is the last time he will be below $5,300. Just take the discount and say thank you.